Recently I wove a commissioned wool area rug (actually a wall hanging in this case) to hang on an office wall. This was a commission that came about because someone saw one of my rugs on a web site I didn’t even know about. The woman who commissioned it then went to my web site, nancykennedydesigns.net and liked what she saw. She contacted me and together we worked out the modification of a rug design (“Autumn Maze”) that she selected from my web site. She needed a different size and color scheme. As I was weaving the piece in the colors she had selected, I wasn’t entirely certain I liked the combination very much. However, it was not for my own home, so I totally respected her choice. I finished the piece and shipped it off to her and asked if she would send photos of it hanging in her office. When I saw photos of my hanging in context with her surroundings, I learned something very valuable. Trust that the client knows her own taste. The other art work and the wall colors of her office totally complemented my weaving. I then knew she had made an excellent color and design choice. A commission is definitely a collaboration between the artist and the client. 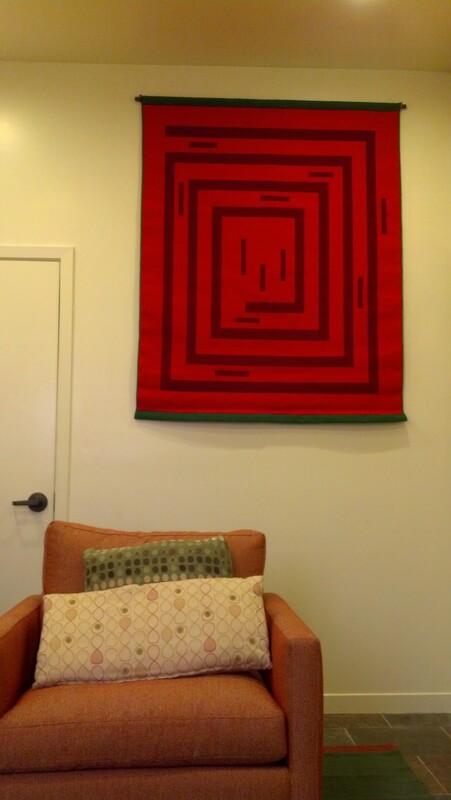 It is important for the artist to listen and to honor the client’s choice The photo of her wall hanging is now on my site and its title is “A-maze.” Working on the commission for this client was a pleasure. She has given me permission to show readers of this blog photos of the piece hanging in her office along with some of the other art work so you can see how it all works very well together. The color I was dubious about was the green hem and edging, but seeing photos of the paintings on an adjacent wall, it makes perfect sense. 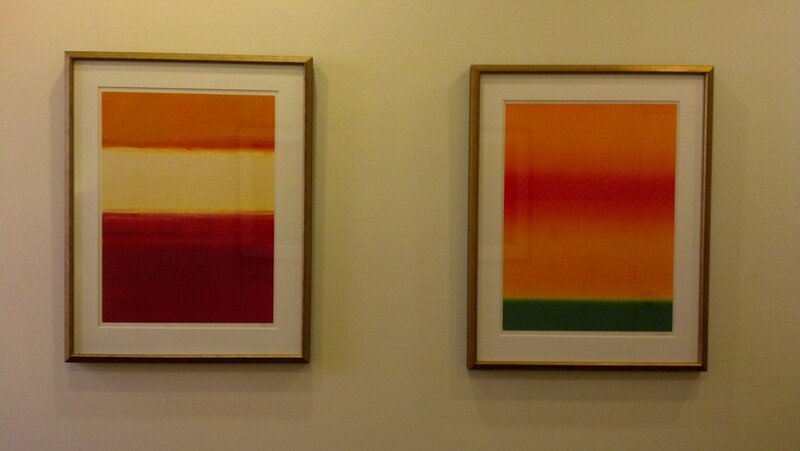 She has two other paintings by the same artist and they contain some of the same colors. Currently I am working on another commission for a 5′ by 7′ wool area rug, which again meant collaborating with the client. When it is finished it will also be posted on my web site. Stay tuned. I welcome commissions for either wool area rugs or rag rugs. My rag rugs are designed the same way as my wool rugs, but are at a lower price point.